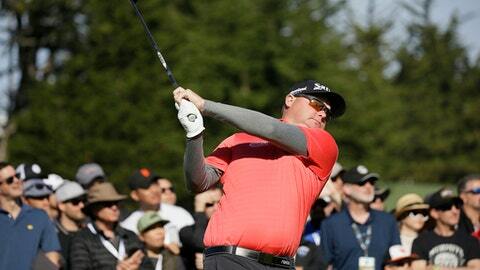 PEBBLE BEACH, Calif. (AP) Ted Potter Jr. outplayed the world’s No. 1 player and held off everyone else Sunday to win the AT&T Pebble Beach National for his first victory since a broken ankle nearly ended his career. He stepped off a curb in Canada in August 2014 and broke his ankle, keeping him out of golf for two years and then back to the minor leagues a year ago. Potter’s only other victory was at The Greenbrier Classic in 2012. He has missed the cut in 55 percent of his PGA Tour events in his career. And then he didn’t flinch next to Johnson, with Mickelson making a late charge and Day never too far behind. Potter, who came into the week at No. 246 in the world, earns a trip back to the Masters for the first time in five years. He finished at 17-under 270 and earned $1,332,000, nearly half of his career earnings going into the week. Potter now has a two-year exemption on the PGA Tour, along with getting spots in the Masters and PGA Championship. It was another disappointment for Johnson going into the final round. He now won five out of 12 times when he took at least a share of the 54-hole lead into the final round. Johnson shot 72. Mark Calcavecchia took advantage of Bernhard Langer’s messy finish to complete a wire-to-wire victory in the Boca Raton Championship. Calcavecchia had a 20-foot bogey save on the par-3 16th and parred the final two holes for a 2-under 70 and a two-stroke victory over Langer on The Old Course at Broken Sound. The 57-year-old Calcavecchia won his fourth senior title and first since 2015. Langer bogeyed the final two holes for a 70. Tied for the lead after Calcavecchia’s bogey on 16, Langer fell back on the par-4 17th when he left a 4-foot par putt to the right. On the par-5 18th, the German drove to the right into pine straw and wood chips and found two bunkers before reaching the green. Calcavecchia finished at 16-under 200. He opened with a 64 for a one-stroke lead and birdied the final three Saturday in a 66 that left him two shots clear of Langer. The 60-year-old Langer won his home event in 2010. Kiradech Aphibarnrat of Thailand won the World Super 6 Perth with a 2-and-1 victory over James Nitties in the six-hole final. Kiradech had to win five six-hole matches for his European Tour title since the Saltire Paul Lawrie Match Play in 2015. He reached the championship match by beating Lucas Herbert in a 90-meter shootout hole. In the final, Kiradech overcame an early deficit with a par on the third hole, and then followed with an eagle and a birdie to close out the Australian. The field was reduced to 24 players after three rounds of stroke play, followed by a single-elimination of six-hole matches. Kiradech won for the fourth time in his European Tour career. Ben Taylor shot his second straight 3-under 68 for a six-stroke victory in the Club Colombia Championship. The 25-year-old Englishman had a 15-under 269 total at Country Club of Bogota and earned $126,000 for his first Web.com Tour victory. He played at LSU, helping the Tigers win the 2015 NCAA championship. Erik Barnes (67), Sam Burns (68), Jason Gore (71) and Kyoung-Hoon Lee (64) tied for second. Jiyai Shin of South Korea closed with an 8-under 64 for a six-shot victory in the Canberra Classic, a tournament co-sanctioned by the Ladies European Tour. Shin, a former world No. 1, won for the 50th time worldwide in her career. Minjee Lee, coming off a victory last week in the Vic Open, had a three-shot lead going into the final round but closed with a 73. … Matias Calderon of Chile holed a 40-foot birdie putt on the 18th hole for a 7-under 65 to complete a six-shot comeback and win the Eye of Africa PGA Championship on the Sunshine Tour.